The busiest day was the first of the month, with about 178 million spam comments — and the slowest day was the 18th with about 106 million. The total number of spam messages caught this month was 4,090,182,500. To visualize this, let’s say each spam is represented by one blade of grass in a football field — to commemorate the football season ending this February. 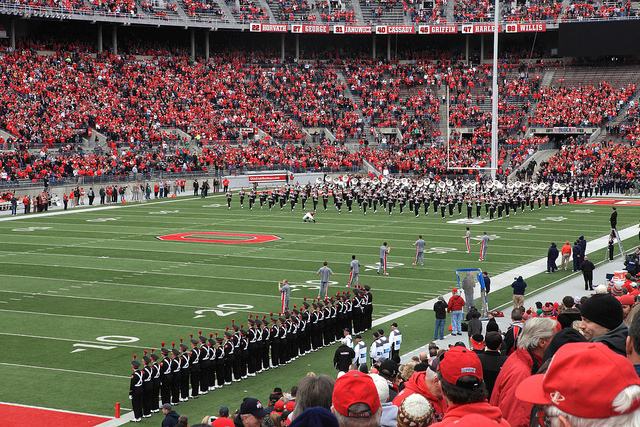 How many football fields would it take to cover that much spam? Twelve and a half. How about the real comments? We got a total of 131,465,000 of those this month. And if each one were represented by a blade of grass, they would take just under one half of a football field to account for. As always, real comments account for much much less than spam comments — about 3% this month. This month was unusually low in spam numbers not only compared with last month (with a 14% decrease in volume), but also since last year — decreasing by 38% compared with February 2014. We missed only about 1 in every 10,917 spam comments this month — not bad! January has been a slow and steady month in Akismet-land. Whereas in months prior, we’ve broken daily spam records, in January the spammers took it easy and we never saw a day with over 300 million spam comments caught. The busiest day in January was the 4th, with almost 257 million comments, and the slowest was the 29th with just over 174 million comments. The total number of spam comments caught in January was a mere 6,586,661,000 – compare that to the over 10 billion comments in December, that’s a drop of 35%. 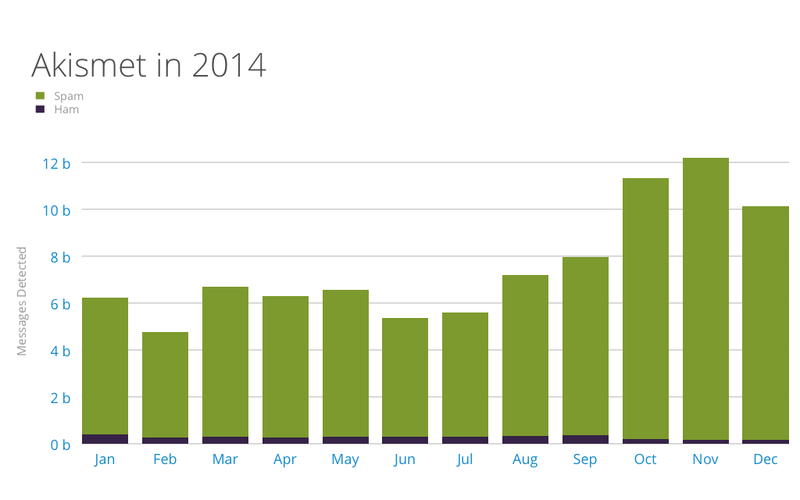 We did have more comments this month than the same time last year – 5% more. Let’s put this number in perspective. The latest figures for the world population were published in 2013 by the world bank, and the number was just over 7 billion. If we wrote down each spam comment caught this month on a piece of paper, and handed out each of these notes to one person in the world, we’d have enough people on earth to hold all of the papers. In fact, we’d have some people left over that didn’t need to hold a piece of paper. In contrast there were only 157,555,500 legitimate comments that came through this month. Legitimate comments account for about 2% of all the content Akismet sees come through. If we wrote down each legitimate comment we got this month on a piece of paper and gave each to one person, we’d need just 2% of the world population in order to hold them all. As for Akismet’s uptime: there were no service interruptions this month. You can find information about any performance issues on this blog, via Twitter, and on this status page. 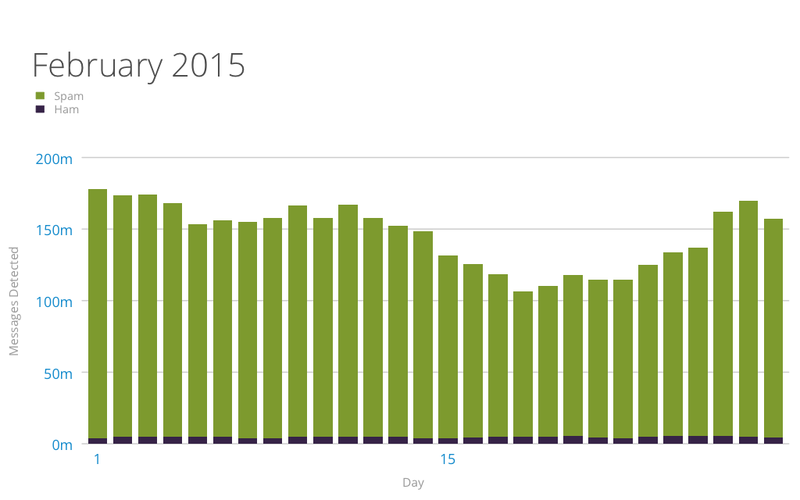 You may have also seen a drop in spam comments this month on your own blog. If you are having any issues with spam or with Akismet, please feel free to contact us, we’re happy to help :mrgreen:. Gone with the Wind is the highest-grossing movie of all time – making over 3 billion dollars1. The next highest-grossing film is Avatar, with just over 2.7 billion dollars to its name. In December, Akismet caught 10,136,855,000 spam comments – that’s just over 10 billion. If each spam comment were one dollar, that amount would be about equal to 3 times the total sales of Gone with the Wind. Not too shabby. On the other hand, Akismet saw just 156,497,000 real comments go through in December. If each one of those were one dollar, they’d make up about 4% of the total sales of Gone with the Wind. As is usual, we see much less real comments than spam comments – at a ratio of about 1 to 65 this month. The busiest day of the month was the 5th with just over 409 million spam comments, and the slowest day was the 10th with just under 267 spam comments. For the first time since June, Akismet saw a drop in the number of spam comments month-to-month – we dropped 16% compared to November. However, we still saw a rise of 52% since last year in December. How do the numbers fare against the highest grossing movies of all time? In January 2014, Akismet saw about 6 billion comments go through in total. If each comment were one dollar, that’s like the total sales of Gone with the Wind and Avatar combined. Things were moving along at about the same rate until August, when we started noticing much more spam coming through. In September we hit the 300 million spam caught per day mark. In total, there were 8 billion comments caught. 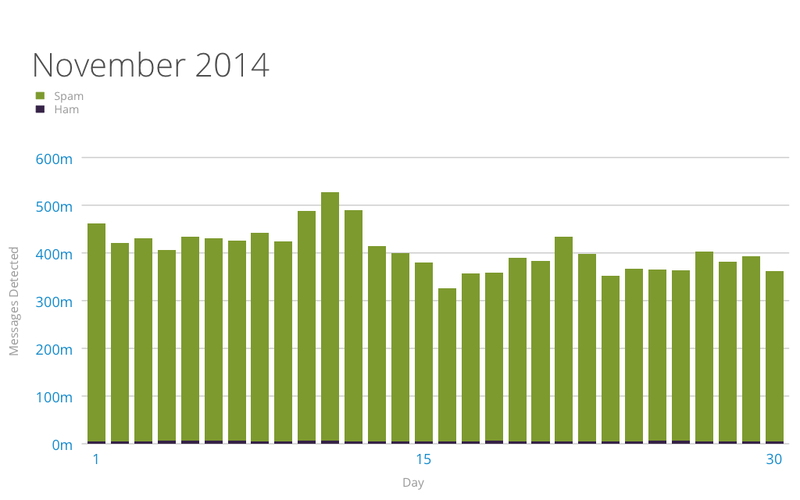 November was our highest-traffic month with over 12 billion spam comments caught. Continuing with our movie example, that would be like adding up the totals for the top 4 highest grossing films and then a little more: Gone with the Wind and Avatar and Star Wars and Titanic. What about the total amount of spam for 2014? That’s 90,326,951,500 – like adding up the total sales of the top 10 movies… and quadrupling that number. Over the year, you may have seen similar trends in the amount of spam comments that you see come through on your own blog or website. As always, if you’re having any issues please do contact us, we’re happy to help! We’re looking forward to an even more fruitful 2015, with Akismet continuing to save you from your spam. All of us from Akismet wish you a thrilling, successful, and happy new year! The streak of breaking records at Akismet is not coming to an end. 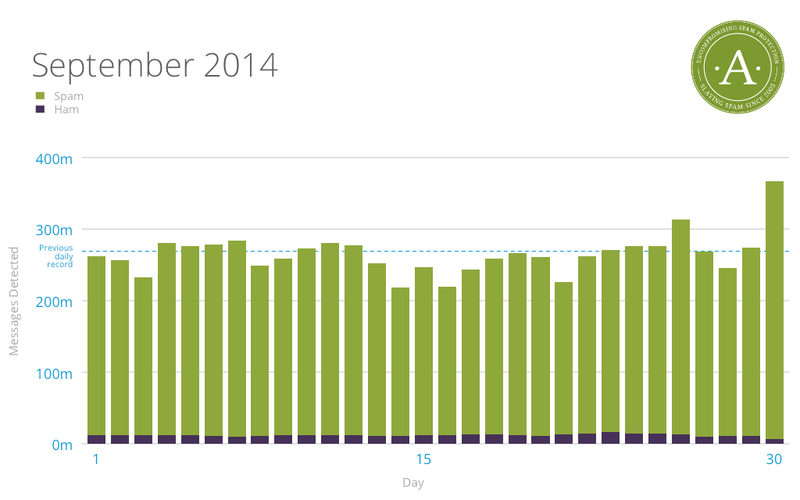 In November, we broke 500 million spam message caught per day. Maybe the streak will continue, with 600 million spam messages caught in a day in December, we can only hope. The busiest day of the month for spam was November 11 with over 526 million comments caught. The slowest day was November 16 with just over 326 million comments caught. We missed only about 1 in every 32,243 spam comments this month. In total, Akismet caught 12,204,897,000 spam messages in November. Let’s compare the number of spam comments Akismet caught to the distance between the Earth and Saturn, which is 1.2 billion kilometres when the two planets are closest together (that’s 746 million miles). If each spam comment were one kilometre, the total number of spam comments Akismet flagged in November would be enough for 9 one-way trips to Saturn. As usual, Akismet saw much less ham going around, for a total of 159,568,500 this month – making up 1.3% of all comments Akismet checked. If each ham comment were one kilometer, they would make only enough for a tenth of a trip to Saturn. That’s only enough distance to get to Mars and back. Your own blog’s comments may have also seen some dips and rises. If you’re having any trouble with missed spam comments, false positives, or any other issue, please feel free to contact us about it, and we’ll be happy to help. Akismet had another record-breaking month in October. While in September we hit and surpassed the 300-million spam messages per day milestone, in October we saw over 400 million spam messages come through per day on 12 different days. There was a rise of 44% in the number of spam comments caught from last month, and a 185% rise from last year in October. In total, Akismet caught 11,337,365,500 spam messages this month, and 207,939,000 ham messages. 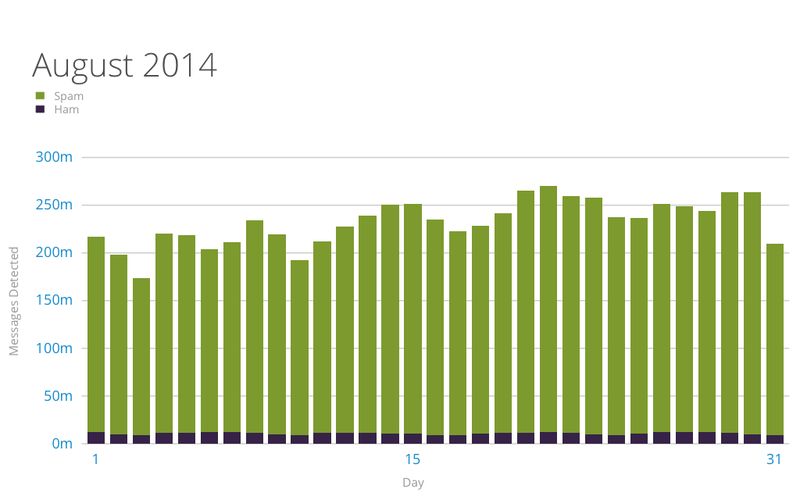 As usual, the amount of legitimate messages going around is much less than spam – coming in at 1.8% this month. To help visualize the numbers, picture a trip from the Earth to the sun. It is 150 million kilometres long on average (that’s approximately 93 million miles). If each kilometre represents one spam comment, it would take 75 trips to the sun to account for all the spam comments Akismet saw this month. On the other hand, if each legitimate comment were one kilometre, it would make up only one trip and a third. The busiest day for spam for Akismet this month was the 29th, with over 482 million spam comments caught. The slowest day was the 12th (coming in at only 273 million). Akismet missed only about 1 in every 11,475 spam comments this month. Your own blog’s spam comments may have followed similar rises and falls, and seen some missed spam comments. Please mark those missed comments as spam so that Akismet can learn from your feedback. If you notice a large number of spam comments coming through uncaught by Akismet, please contact us and we’ll be glad to help. In August, there were 7,203,785,500 pieces of spam that came through Akismet. If each piece of spam were one word, it would take 6645 copies of the Harry Potter series to accomodate them all. Our busiest day was August 21, with about 269 million spam messages, and the slowest day was August 3 with 173 million. We missed only about 1 in every 5,916 spams. The number of spam message is up 92% from last year, which is a similar large rise we’ve seen in previous months. It’s also up from last month by 28%. The number of legimate messages that went through this month is 33,377,8500. If each legitimate comment was a word, they’d only fill 307 copies of the Harry Potter series. The amount of legitimate content going around is only about 4% – and the large difference is business as usual. As always, if your own missed spam or false positive numbers are on the rise, we’d love to help. You can reach out through our contact form. August was a big month in the spam universe, three services were in the news. Google added new spam filtering support to Gmail – you can find more info on PC World. Twitter announced its new spam filtering system, BotMaker. And, Apple’s iMessage seems to have been hit with a bout of spam. Wired explained why, though MacWorld showed us why the numbers may not in fact be so dire.